In engineering and science, objects of study or design are called systems. This is a very general word that you have probably seen used in expressions such as: “computer systems,” “the solar system,” “star systems,” “power systems,” “weather systems,” etc. Engineering and the sciences rely on a feature of physical and biological systems that they have noticed: predictability. Prediction is a big part of human life and survival in general, so there is little wonder that the sciences would be concentrating on technologies of prediction. One such technology is computer simulation. But for computer simulation to work, the system being simulated must first be turned into a mathematical model. Thus, this term – used with this meaning – has also entered the modern vocabulary. In this discussion, we don’t need to take up the technical details of how models are constructed. I just want to go over how they are used, and how we tend to use them without even thinking about it. Ordinary people use models all the time, but don’t always call them that. The rules for polite conversation could be considered a model. The rules for impolite conversation could be another model. A word could be considered a model for what it represents, though it would be more correct to call the definition of the word the model, and the word just the name for the model. Broadly, a model is our concept of something. Take evil. One person’s model for evil could be “the work of the Devil.” Another person could see evil as the result of operating on disastrously incorrect data. A third person could see evil as the result of accidents or mistakes. When you ask these three people “what should be done about evil in the world?” you will get three very different answers. What you should really ask them first is: “What do you think causes evil in the world? Then, they’d give you their models. Their answers to the other question would probably make sense relative to the model each was using. Thus, the decision-making process can be greatly influenced by the model being used for the system that is being discussed. For good communication and better understanding, we want these models openly stated. Secret models will cause trouble. We can think of a person as just an animal body. This has worked, to some degree, in medicine. If all medicine wants to do is fix bodies, then it can do a lot based on the body model. 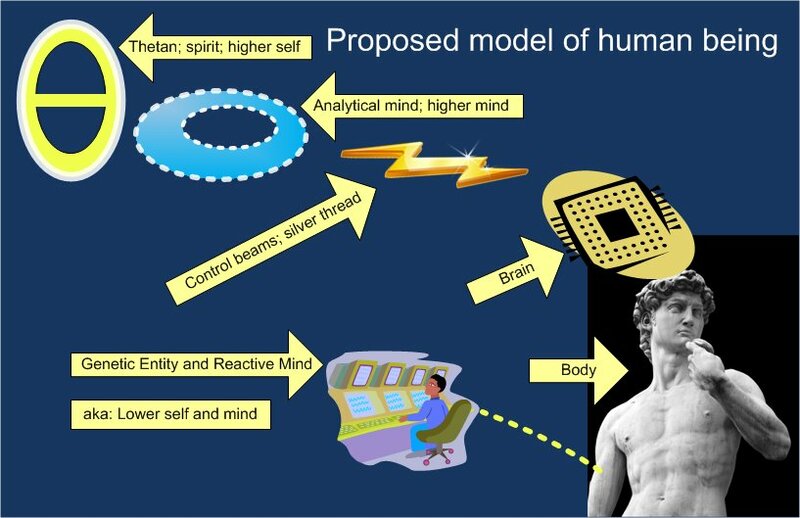 The details of this model are incredibly complex, but the upper-level definition of this model is simple: The human is a biological machine (organism). The body model only takes us so far. Philosophers have always spoken of the mind, so we are used to talking about it, even though no one has exactly “seen” one. 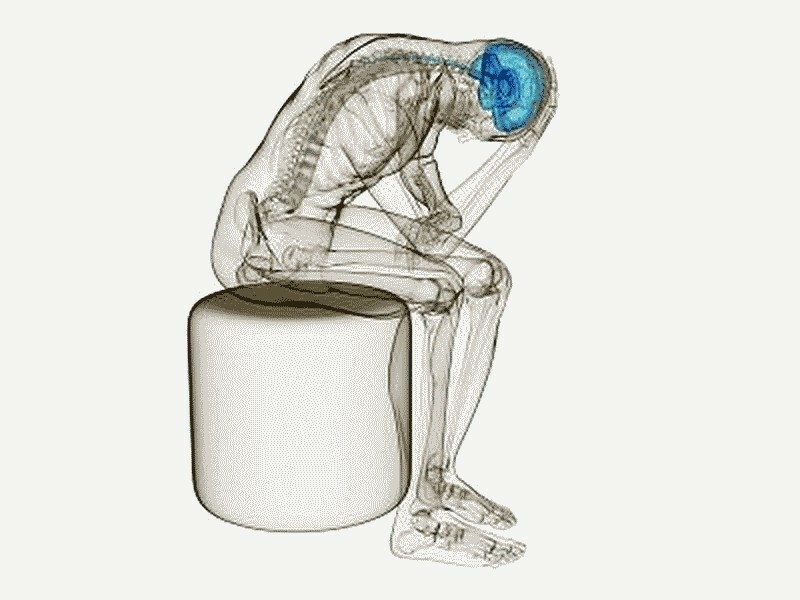 Medicine assumes that the mind totally resides in the brain. But this model is insufficient to account for a large variety of non-medical phenomena. Thus the work of Freud, etc., “fills out” the brain model of the mind into something more conceptual but more useful. Though neurology, strictly speaking, continues to reject the Freudian and other concept-based mind models, the Freudian model is the basis, I have been lead to understand, for the whole field of modern marketing and PR. We have a nephew of Freud’s, one Edward Bernays, to “thank” for this “revolution” in the business world. You can tell, no doubt, that I doubt the wholesomeness of this development. I cannot, however, deny the fact that it has worked. And that workability gives the Freudian model some validity. According to Freud and his followers, the mind has parts. The neurologists have tried to map these parts to locations in the brain. But the psychologists and others don’t care about that. They just want a model that will predict human behavior better. Computer scientists, spurred on by science fiction writers and god knows what else, have always been interested in the possibility that a computer could be programmed to “act more human.” This is artificial intelligence. In its more limited application, all AI is trying to do is to get machines to figure out how to learn. Now, strictly speaking, all animals can learn, not just humans. But, this has been one of the AI goals. Another direction for AI has been the subject of human replacement. 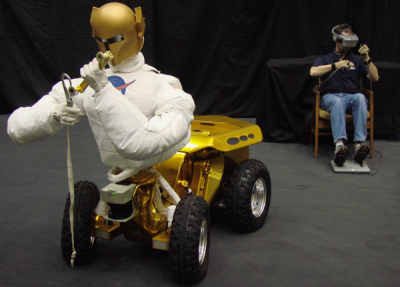 In some situations, it has been argued, a robot could do a better job than a human. This might be because a machine could be built to withstand environmental factors that would be fatal to humans. Or it might be because the machine would not “get scared” like a human might, or might not “get tired” or “get bored.” Though much of this work has led to machines with human-like body capabilities, there has been another branch of this work that has gone in the direction of care-giving and education. In these applications, emotional awareness, even emotional expression, is desirable. But how do you get a machine to learn human emotions? Believe me, folks; they are attempting this! 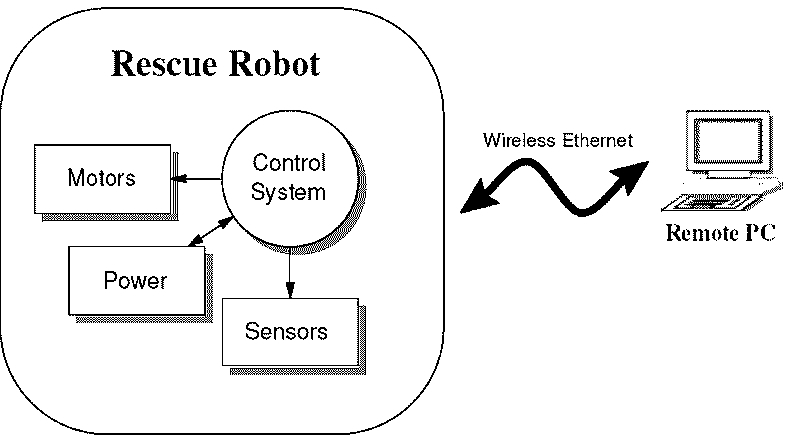 So far, the biggest advances have been made in the field of remote-controlled robotics. A recent example, as ominous as it is, is the drone bomber. But there have been many such devices designed, built and used. So we know their model is workable. The high-level parts of this model are diagrammed below. 1. The robot as a machine only. This would correspond to the human body, alive but unanimated. 2. The local machine control system. This would correspond to the brain. It is essentially an electronic computer. It runs on “firmware” (semi-permanent software). 4. A remote control console. This would correspond to the mind. Note that the mind runs on a combination of software and input from a control person. Also note that the mind contains a copy of the brain’s “firmware.” Ideally, every single perception, command, action, and result is recorded for possible later analysis and software improvement. Thus, the mind also needs a memory system. 5. The control console operator. Not pictured in the diagram, this is in some ways the most important part of this model. This guy is supposed to be in control of the entire system, determining its every waking move. The following diagram gives a more fanciful depiction of this model. 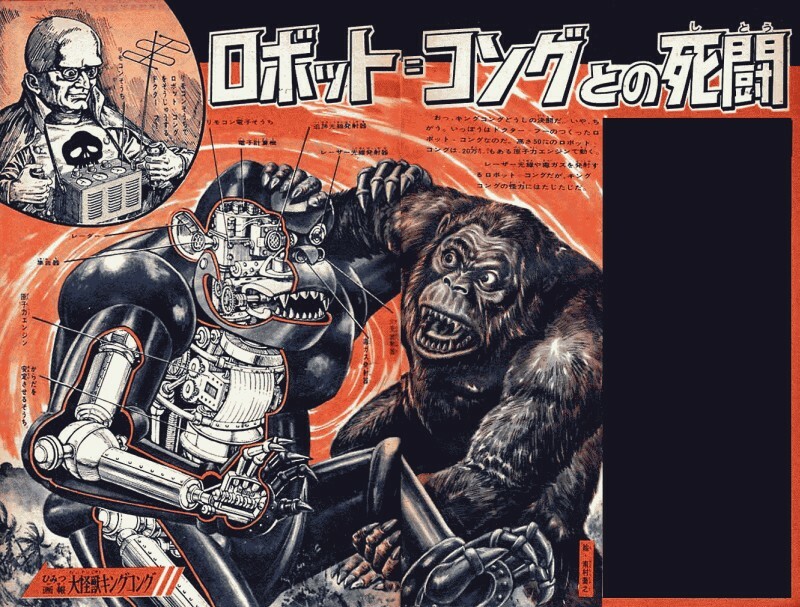 Remote-controlled fighting monster from Japanese magazine. There is still something missing in this model. What if something happens to the console operator? What if he has to go to the bathroom? What if somebody sneaks up behind him and bops him on the head? What if he gets so emotionally involved in the activity that he passes out? What if the hardware is damaged? For a “mission critical” application, the console operator needs some sort of backup system. By empirical observation it has been found that such a backup system exists. It is more or less attached to the body. Its exact nature is not totally known. Conceptually, it can be thought of as another console and console operator, but one designed to never go offline. This console operator is not responsible for any high-level decision-making. It is designed only to protect the hardware in the event of loss of higher-level control. In exchange for not being “brainy” this operator must stay alert 24-7. It monitors all vital body functions. It sends warnings when the bladder or gut are full, or when the stomach is empty. It has certain override powers in the event that the higher level does not respond to repeated warnings. In general, this operator has capabilities similar to the high-level operator. But it plays (usually) a subordinate role in the system. Its console also has recording capabilities, but they do not necessarily include all data from the higher level operator. The higher-level operator has access to all the data in the lower-level console, but it is protected. Access is only granted under certain special conditions. So there is a certain amount of autonomy between the senior and junior control systems. This is a significant advance over a one-controller system, but is gained at some cost. In my studies I have learned of a more workable model for a human being, which is illustrated above. My illustration uses terms for the main parts of this model, that I learned from my studies, as well as some more traditional terms. I cannot guarantee that all these terms are correctly matched. If you read this and see obvious mistakes, let me know! Thetan; spirit; senior console operator; higher self. Analytical mind; senior control console; higher mind. Genetic entity; junior console operator; lower self. Reactive mind; junior control console; subconscious mind. I will not take up the ramifications of this model in this article. But needless to say, at the expense of some increased complexity, it predicts a far broader range of observed human behavior and capability than does a previous over-simplified models. Since the internet was developed in the 1980s, we have had an increasingly distributed data infrastructure in the US and other developed countries. In other words, important data are stored on “secure” servers all over the country, and the world. BUT: The paradigm remained central control! In the former system, the central computer was the only system where data could be stored securely. Access to the central system was obtained through a “dumb” terminal. “Dumb” just meant no local data storage. The personal computer, which came into its own at about the same time as did the internet, was a potential threat to that paradigm. Ever since PCs came out, the pro-central-control guys have been trying to figure out a way to make them obsolete! And so, with “cloud computing,” “mobile computing,” etc., they are. MAYBE centralizing anything seems more efficient. If you can print out a document you just created on a little printer in your office, that’s a lot more convenient that going down the hall to the big central printer. But management says it’s more expensive. Next thing you know, the big printer breaks down. The only reason the group survives is because they could fall back on the small printers that people kept in their offices! But if you have a central control nut at the helm, what will the answer be? Get another big printer to reduce the chance of catastrophic failure! The lesson goes right by them; they probably can’t even see it. …and that will still be the case if we centralize solar. What if every building had its own system? If it goes out, you just mooch off your neighbors for a few hours or days until it’s fixed. Major state-wide disaster? Nope. Cyber crime researchers report that US losses from identity theft fraud have been hovering over 50 billion per year for several years now, with the number of victims topping 10 million. What makes this possible? The central control nuts. All “hackers” need to do is break into one major secure server to suddenly have thousands or millions of names, billing addresses, and credit card numbers. What if all your personal data were in your wallet, or in a safe (or encrypted hard drive) in your house? Could finance and industry still function if private data were really private? I think it could. It probably always could have worked that way. If you rent an apartment, you and your landlord (or building manager) have a key to your room. And that’s all. If you own your home, you could be the only one with a key to get in. Could you do the same thing with a bank account? Does your bank really need to know your name, where you live, and who your favorite grade school teacher was in order to provide you banking services? Do they need their own copy of the key to your safe deposit box? No. So why should they have free access to your account? They shouldn’t. Cybernetically speaking, they should have “read-only” access. These days, banks are allowed to debit your account for “fees.” In the old days, they would have had to find some way to make money off your deposit, or else bill you for the fees. Then you could authorize debit from your account, or pay the fees some other way. Your bills and payments would be on the bank’s account with you, not on your account with them. How would this work? The account itself, though it is your asset, is on their books (computer). Their computer system would have to demand authentication from the account owner before changing anything on your account. In the old days this would have been accomplished by a bank employee recognizing your face or your signature. In a computer, it would have to store some sort of hash or similar token. A hash is a number that is created by a character string. There is no way to guess what character string generated it. The only way to “crack” a password hash is by “brute force” – trying every conceivable combination of characters until you get a match. Thus, the more imaginative your password is, the harder it is to “crack.” So a hash is a fairly safe token to store on a central computer. When paired with an account number, it should give the account owner control over that account. Does a group you do business with need your name at all? Well, it’s certainly the conventional style to identify yourself by your name. But even this habit could theoretically be bypassed if the individual were held responsible for keeping track of the messages sent to him. Email addresses, for example, do not have to have your name in them (though most do). So if the bank had your email address and your account number, that should be all they need to contact you. Their messages would have to say “Dear Customer” at the top instead of “Dear Larry.” Big deal. If you are going to make financial transactions over the internet (see my articles about the idea of making money obsolete) then your passwords have to be sent to the computer of the business you are doing business with over the internet. And the internet sends data in “packets.” By default, these packets are readable. To make them unreadable, they have to be encrypted. Encryption is a pretty good system. It takes a little more time. With modern fast computers, that time is very small. And besides, the only important things to encrypt are your passwords. The vision is of a much more secure, decentralized system that results in much less crime. One huge way to reduce crime is to take money out of the system. That is a big step, but someday we may do it. The important point is this: You don’t drop record-keeping. You don’t use money to buy and sell things, but you do keep records of purchases and sales. The remote computers you have accounts with store a username (email address) and a password hash. And that’s all they need. They proactively send your data (which ideally would not include anything financial) to your email inbox, where you may collect it at your leisure. You prove you are who you are by providing the email address and password, encrypted. These data are stored in your “wallet.” Only you have a “key” to your “wallet.” That key can be a piece of hardware, but it operates on the same principle as a remote login, and could in fact be used to transmit that login information, so you wouldn’t even have to memorize it. If you lost your “wallet” you’d be in deep doo-doo. But it doesn’t mean you’d be taken to the laundry, because the thief would also have to steal your key. So: Just don’t keep your keys in your wallet! Having a secure backup of your wallet (and your key, I suppose) would be part of the system. Of course, the central control nuts will find all manner of reasons why this would be impossible. The problem is: Their spokesmen (think Hillary Clinton) keep talking up freedom and democracy while their actions keep resulting in slavery and tyranny. Their crimes are being exposed, and with any luck, their systems are not much longer for this world. They will need to be replaced with something else. Will the new systems be better, or built on the same old paradigms that the criminal systems were based on? I hope this gives you some small clue why I bother to write articles like this. The “White Hats” are basically a PR group working for what is sometimes described as an association of Secret Sacred Societies. This article will address these matters at a conceptual level. I have no direct knowledge of any of this. It is an empirical (according to direct experience) fact that people and groups do better, by their own estimation, in proportion to how much freedom they consider themselves to have. The greatest evidence of this is the United States, where quite advanced levels in the standard of living were broadly reached, based on a model of government for the people, free enterprise, and protection of basic unalienable rights. However, this has been, for the most part, an advance in the material standard of living. Recent events are evidence of this. When a setback occurs, people get nervous, indicating that they lack confidence in themselves and their institutions to solve the problem. Spiritually advanced beings would not react like that. Thus, most of us think of “freedom” in the context of the material world. But that was not its original context. Originally, “freedom” meant freedom from the material world. Imagine that in ancient times, beings existed who used non-biological bodies. Such a body might look a bit like a marionette, or a robot. When you need it, you pick it up and operate it. And though everyone can tell it is a puppet, it serves as an actor on the stage of life. But when you don’t need it or want it, you simply lay it aside. You don’t have to feed it. It doesn’t need air or heat. And it can be replaced by creating, borrowing – or stealing – another one. Now this, compared to biological existence, is freedom. Would you not agree? Think of the problems this could cause for the proprietors of, say, a planet. They are using this planet for something. Perhaps mining it for metals. The metals are used locally to build machines, or perhaps shipped back to a home planet. Mining metals is hard work. Non-biological bodies can do it better than biological bodies, but if they don’t like working conditions, or get bored, they can just leave. Though the perception of freedom is valuable, and results in better production, it was a problem for these managers. So they embarked on a plan to “fool” people into desiring biological bodies. And so, by secret programs, non-biological bodies were given a bad name and eventually were more or less abandoned. Of course, there were some who were aware of this coercion. And so a resistance movement was established. And, of course, it too, had to be secret. These stories seem fanciful. They represent the long ago and the far away. Yet this scenario may have played out on earth as little as 15 to 20 thousand years ago. There is some indication that this may be the case. But regardless of exactly how we trace its roots, be assured that this conflict has continued to this day, and is active on this planet, and always has been. And so you get one set of secret “sacred” societies attempting to forward the con game that favors biological bodies. And you get another set of secret sacred societies attempting to somehow counteract this con game, even though they have forgotten how to make or use non-biological bodies. The latter group is referred to, loosely, as the White Hats. They refer to their rivals as the Dark Cabal. The Dark Cabal refers to itself as “the family” or “the organization.” It seeks to infiltrate and control all human institutions, both public and secret. By many accounts, it is close to accomplishing this on earth. The Dark Cabal has had a rough time on earth. Until recently, resources seemed quite plentiful. And they may in fact still be. A certain sense of abundance could be attained here, and that encourages thoughts of freedom and higher purpose. And so they attempted to play an old trick on us. They “monetized” everything. So, unlike in a “primitive” culture, where the whole group cooperated to maintain itself, in a “modern” culture, you have to have money to do anything. Thus limiting the supply of money, and its availability to certain sectors, imposes a sense of scarcity where it might not otherwise exist. I am flabbergasted that this con worked. But it was globally successful, and money has been in wide use since at least the days of Rome. The Dark Cabal specializes in the control of money, though it has also invested heavily in other strategies. And the White Hats specialize in the de-control of money. My knowledge on this subject is incomplete. The impact of the first World War was so great, compared to previous large wars on earth, that diverse nations felt compelled to meet together in hopes of preventing further destruction of such magnitude. The Dark Cabal was ready with its argument and its plan: It was the hoarding of gold that had caused the war. What was needed was to divorce the idea of “wealth” from the possession of real commodities, such as gold. Several of the large countries (already infiltrated by the Cabal) supported this argument. Most others were leery of it. And so plans moved forward to move the planet off the gold standard, though it was met with some resistance. The plan involved the moving of all public and privately-held gold – except little trinkets – under the “protection” of a central banking system. That system would issue money via national treasuries, and make loans on favorable terms to assist member nations to improve their economies. Not all countries trusted this plan. And so a second World War was staged. And under its cover, those countries were looted and their gold and other precious metals and gems taken to secret vaults guarded by well-armed soldiers. The various parties were given receipts for this gold, in the form of US Federal Reserve Notes of large denomination. It was promised all those involved that they would have access to funding in proportion to their contribution to the gold store. But this did not happen. This lead, in time, to at least one lawsuit being filed at the International Court in The Hague (a town in the Netherlands) by some of those who had given up their gold. The suit asked for funds to be released for national improvement projects, as had been promised. The court ruled in their favor. But the funds were never released. From what I gather, this is what “the release of the Global Settlements” refers to. The White Hats are still fighting to make this happen. This is, in fact, the current centerpiece of their program. The people behind the White Hats, in their zeal, I fear have lost track, a bit, of their founding principles. They may feel a bit trapped in their current game to free up money on Earth. It seems they have forgotten about the reduction of freedom caused by biological bodies. If they could remember that, they could find a new way to handle this whole situation. I wonder how many economists study the physical sciences. Because this is what they propose about money. Facilitate the creation of space. Measure the extent of space. He would tell you that you were crazy. One concept cannot fulfill all those different roles. The creation of space is assigned to God. The storage or delineation of space is assigned to boundaries. The measure of the extent of space is assigned to length. So, what would be a scientifically valid approach to the concept of value? The creation of value would me assigned to Man. The storage of value would be assigned to commodities. The measure of value would be assigned to money. Money could not create (or destroy) value. Money could not store or lose value, i.e., money could not be a commodity. Money could not “change in size.” It would have to be standardized on some amount of some commodity. Before the time of the reserve bank system, money was treated more like this. But it was confused with currency, and so was forced to be turned into a commodity. That was a giant mistake, simply from the point of view of science. Because it totally destroys the “science” of economics. If we do not succeed in making money into a unit of measure, fixed to some standard amount of some standard commodity, then we have no chance of unconfusing the subject of economics. Maybe money should be defined as a special type of commodity. But this means that we will need some other concept for a standard unit of value. But let’s say we decide to use “money” as the name for our concept of a measure of value. We have different unit systems for this measure. Dollars, yen, yuan, rubles, shekels, francs, marks, etc. “Commodity” is our word for something that stores value. And we have various concepts for what creates value. But “value” is obviously a function of human perception. Now, commodities can be marketed. In fact, they must be, as that’s the only way we have of determining their money value: How much is someone willing to pay for something? But money cannot be bought and sold. It is the measure of value. Who ever heard of buying and selling length, weight, mass, or velocity? Impossible. Money cannot be bought and sold. Only commodities can be bought and sold. Currently, we have very large markets that trade “paper.” These are basically written contracts. They are traded like commodities. I think this practice is silly, dangerous, and wasteful. I think price speculation should be discouraged or outlawed for both regular commodities and paper commodities. In other words, a person shouldn’t purchase something that he doesn’t actually intend to use. When an organization offers a contract for sale, it might state that monthly dividends will be paid based on company profits, or that the company will buy the contract back at going rates after a period of time. We would expect a serious buyer to hold onto that note so he’d benefit from the dividends, or hope for a good payback at maturity. Of course, we all want the option to change our minds. We want to be able to replace something we own with something else or something similar, selling the used item to someone who would still see value in it. Can a similar arrangement be made for trading “used” paper? I can think of various ways to do this. One idea would be to force paper to expire. This suggestion has been made about currency, too. At the end of the loan period, the lender gets what he gets, and the borrower has paid what he has paid, and if the contract was not violated, then that’s it. Another idea is to charge sales tax on all trades. So, say you buy some paper for $10,000 and it pays $500 a year, but you have to pay $1,000 in tax. So you won’t have a chance of making money on that paper unless you hold onto it for longer than 2 years. What justifies such a tax? A person makes a loan (buys paper) with the hope of making a profit. Similarly, a person buys a car with the hope of using it to drive himself around. But who’s providing the environment that makes it possible to make money by buying contracts? Who’s providing the roads that allow people to drive around in their cars? These things boil down to, most often, public works, public services. By providing an environment in which playing the game is possible, government earns a share in the game. And that’s one argument for any kind of tax or fee involving commerce. Another idea is to physically separate the new commodities market from the used commodities market. This occurs in practice, though I’m not sure how much sense it makes. Most commodities lose value after they have been used for a while. But I know there are a lot of people who buy used clothes hoping to make a profit by prettying them up and selling them. You can assume that a commodity won’t be unloaded unless its value (price) begins to fall. But contracts work a little different than cars or clothes. Still, re-selling used clothes or cars is normally thought of as a way to reduce waste in a society, and I suppose selling “used” contracts might have a similar result. Making a failing system work often involves fundamental changes. In this case, that involves a change in attitude towards the financiers of the planet. They have managed, somehow, to keep themselves protected from undue interference for long periods of time. That most of them were wealthy and were connected to influential people I am sure was a major factor. But the evidence is growing that they were lying to us about certain points, and making assurances about their honor that were deceitful. And so our governments became beholden to them. This situation is not tenable. We cannot live to keep the bankers safe. And though we may face their wrath in telling them “NO,” this we must do. The technocrats are not all worthless scoundrels. Saving our earth does involve more complete and accurate data collection. But what are we buying time to do? We are buying time to give ourselves the chance to return to the stars. We have a planet to clear, and it can’t happen overnight. This is why we work for a more ethical world scene. It is our passport to a much longed-for higher place. That place is now within our reach. If we can make enough time now, here on earth.